In part 1 of this 2 part series, I highlighted a few of the challenges that pediatric healthcare systems in Canada and the United States are currently facing. Pediatrics 2040 is a conference that is hosted by the Children's Hospital of Orange County (CHOC Children's) that is working to change the future of pediatric medicine by creating an innovative conference that targets those who are interested in learning about and collaborating on pediatric innovation. However, pediatric healthcare systems cannot be revolutionized without the help and input from the people they are designed to serve: patients and their families. Pediatrics 2040 is a patient-included conference, which means that they are committed to having patients play a central and expert role in helping to both shape and participate in the conference. Patients are experts of their own pediatric medical experience and can speak on the reality of the care delivery they experienced. Their input and stories are vital to understanding current problems and reimagining the pediatric health field. Represented at the conference was the International Children's Advisory Network (iCAN; http://www.icanresearch.org/). The organization has networks of children all over the world and while each individual chapter may go under a different name, they all meet once a month to ensure that kids come together and share ideas with one other. I spoke with Nick Frederico of iCAN who said that the organization facilitates the sharing of "ideas with researchers and doctors, to give a kids point of view into their work -- whether it is pediatric research or healthcare... Kids are experts at being kids, whereas paediatricians are experts on kids, but not on being kids. It not only helps the researchers and the paediatricians, but it helps the children to get more involved in healthcare, medicine and have a voice and more control over their healthcare." iCAN brought children to the conference to experience the child innovators workshop that was held on the first day and to speak on an expert panel. However, pediatric patients are not just lending their voice and their stories to this movement, they are also creating inventions themselves. At the event, I was fortunate to have the opportunity to meet Amy Ohmer and her daughters Reece and Olivia. The three of them run a grassroots, kid-powered think tank called Naturally Sweet Sisters (http://www.naturallysweetsisters.com/), which is looking to change medical programs in a way that makes sense to kids. The youngest daughter, Olivia, now twelve, was diagnosed with Type 1 diabetes in 2006. Then a few years later, Amy's second daughter, Reece, now fourteen, was diagnosed. It was at that moment that the family realized they needed to become advocates and share what they were experiencing to help try to make things easier and better for other kids. As Amy said about her daughters, "they have done some remarkable things having a life that could be very difficult -- they've made it something that is positive and inspiring." The family is helping with the development of an app that is being put together by a group of students called the Michigan Hackers, at the University of Michigan, Ann Arbor. The Diabeticons app will offer emojis that are custom-made for diabetes and will help children to better communicate with their parents and healthcare team. The app came from the sisters' desire to improve how they communicate and happened when the girls teamed up with Dr. Joyce Lee, #makehealth, University of Michigan, Mott Children's Hospital, Pediatric Endocrinology. For twelve-year-old Olivia, she got involved with the app because she likes helping other kids and wants to try to make everybody have a better life with their Type 1 diabetes management. Reece told me that "helping others has always been something that I am really fond of and that I appreciate. When I get older I'd love to be a pediatric endocrinologist." The sisters enjoy working together because they are best friends and having a similar chronic illness makes them able to understand what each other is feeling, allowing them to help each other out. Haygood & Woods Co. (haygoodandwoods.com) were another group of pediatric patient innovators who took home the prize for the popular vote at the Innovation Beach Bash start-up competition. Together, the pair have developed an RFID (radiofrequency identification) wrist band that can physically store imperative medical data. 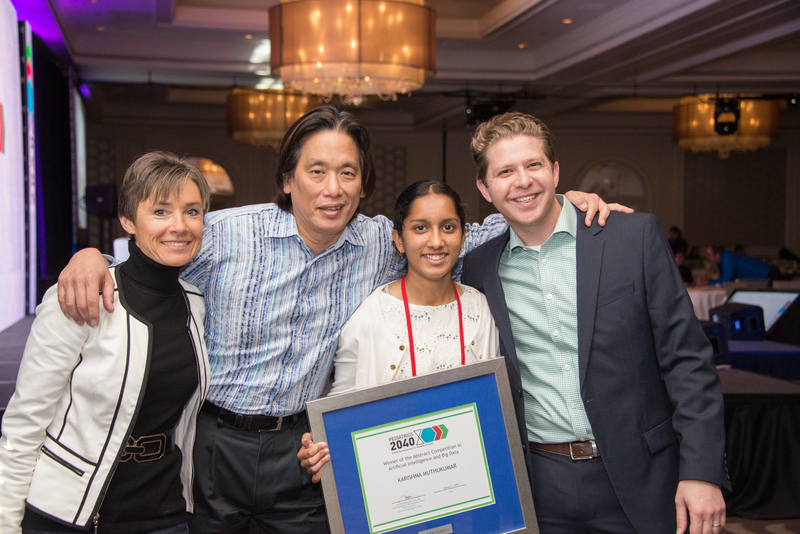 With so many young innovators present, it became clear from listening to their stories that their personal experiences in the pediatric medical world helped them understand ways in which they could innovate the current system for other kids. Additionally, several children presented academic abstracts, including 15 year-old Karishma Muthu, an intern with the Sharon Disney Lund Medical Intelligence and Innovations Institute, who won the best abstract award in the artificial intelligence category. When I asked keynote speaker, Dr. Patrick Soon-Shiong, what his advice would be for young people looking to become a scientist like him, he said that it is important that they follow their passion. For young innovators, NantWorks, in partnership with the Los Angeles Business Journal, founded the Patrick Soon-Shiong Innovation Awards which has awarded a Patrick Soon-Shiong innovation award every year for the past five years in Los Angeles. In the first year of the award's existence, they had 20 companies apply and last year more than 200 wanted to participate. For child innovators, he and his wife, Michele Chan, support kids coming together through their family foundation (The Chan Soon-Shiong Family Foundation) in an annual event where they can show their inventions and a top prize is awarded for the most innovative work. He told me how "it is very wonderful to inspire kids by providing a forum to recognize their work." Having child innovators present at Pediatrics 2040 certainly helped to inspire everyone. Photo was provided courtesy of Pediatrics 2040.